Heartwarming stories of friendships between young and old, and a look at the many health and social benefits of getting different age groups together. Leis an iomadh dùbhlan a th’ ann le beatha an là an-diugh, tha na coimhearsnachdan againn air atharrachadh gu mòr. Le daoine beò nas fhaide, agus teaghlaichean a’ fuireach nas fhaid’ air falbh bho chèile, chan eil na diofar ghinealaichean a’ faighinn còmhla mar a bha iad aig aon àm. Bheil sinn ge-tà a’ call a-mach mar shluagh , agus ciamar a ghabhas sin atharrachadh? Ann an Steornabhagh anns na h-Eileanan an Iar, tha clann sgoile a’ dèanamh deiseil son pròiseact gàirnearalachd ùr le sgoilearan a tha beagan nas sine! Tha Hassan, 18, neach-imrich òg ann an Glaschu, air a bhith a’ fàs cleachdte ri beatha mìltean air falbh bho dhachaigh, le taic bho neach saor-thoileach nas sine. Tha Eilidh a tha 96 agus a’ fuireach ann an dachaigh-cùraim ann an Uibhist a Tuath, mìltean air falbh bho a h-oghaichean agus a h-iar oghaichean Ach tha cèilidhean gach seachdain bho chlann na sgìre a’ toirt toileachas as ùr dha a beatha. San Òban, tha coibhneas aon bhoireannach air beatha aon theaghlach òg atharrachadh gu tur. Sean is Òg – sgeulachdan togarrach, blàth mu chàirdeasan sònraichte eadar sean is òg , agus an iomadh buannachd slàinte agus sòisealta a tha an lùib diofar ghinealaichean a’ tighinn còmhla. With the many challenges of modern life, our communities are changing. With people now living longer, and families living further apart, different generations aren’t getting together as much. Are we though losing something as a society, and how can that be changed? In Stornoway, in the Western Isles, local school children are embarking on a gardening project with some “older classmates”. 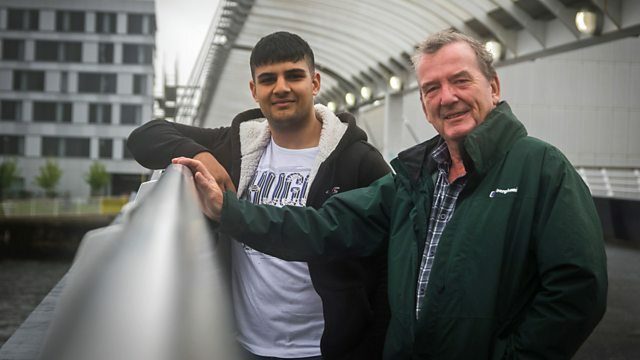 18-year-old Hassan, a young immigrant living in Glasgow, has been adjusting to life thousands of miles from home, thanks to the help of an older volunteer. 96-year-old care home resident, Eilidh from North Uist, is a long way from grandchildren, and great grandchildren. But weekly young/old ceilidhs are providing new joy to her days. In Oban, the kindness of one woman has transformed the lives of a young family.